Our calendar of festive events was enjoyed by all, even though with the timing of Christmas and the late break up of schools we had to pack a LOT into a few days of holiday! Sadly not many pictures were taken – perhaps a stipulation by Father Christmas? But please take the reports by Westminster Music Library and, here, Paddington Library to be representative of a whole lot of fun being had across the borough. 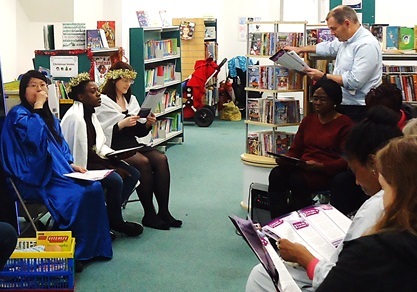 In the middle of December, we welcomed the members of the Westbourne Park Baptist Church Community choir, who staged a nativity with Mary and the three wise men in Paddington Children’s Library. Audience participation was very much forthcoming and along with the resounding carol singing there was abundant gold, frankincense and myrrh, not to mention mince pies, biscuits and fruit juice. 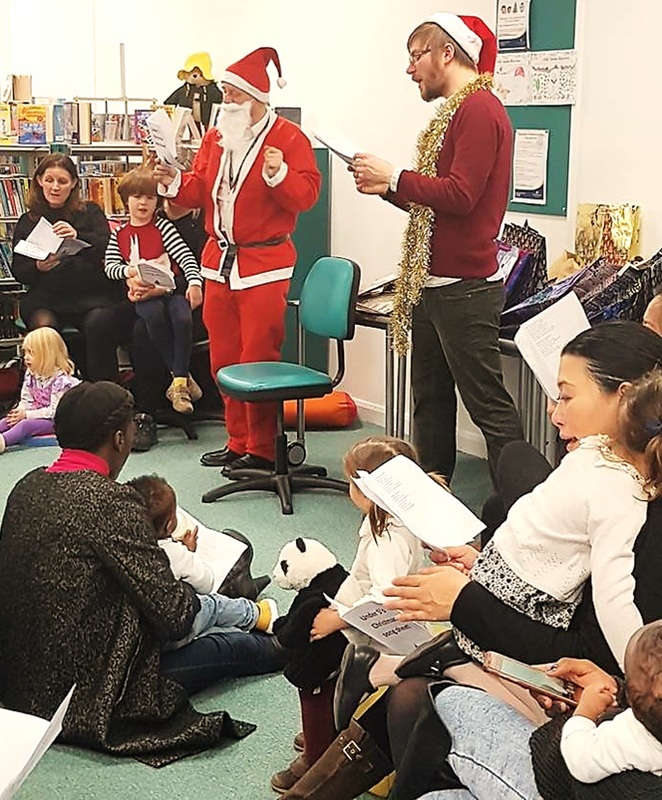 A bit later in the month, Paddington Children’s Library hosted a busy Christmas party for the under fives, with special guest Father Christmas in what looked like a brand new suit! 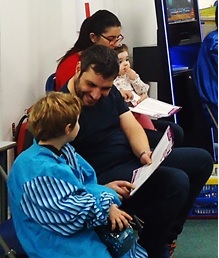 This was Father Christmas’ first visit to our new childrens’ library in Queensway. It has been nearly a year since we moved into the former shop and it is time to reflect on and celebrate the popularity of the Under 5s, the burgeoning homework club with our fabulous volunteers and the numerous class visits, plus the art exhibition courtesy of Lyndons Arts Trust. It has certainly been a good year. Father Christmas was suitably impressed. He was also impressed with the behaviour of the children, all of whom received well deserved presents – a cuddly toy and a book each. Library staff would like to thanks to the South East Bayswater Residents’ Association for its generous support of both events. This entry was posted in Children / Teens, Paddington Library and tagged choirs, Christmas, Father Christmas, Paddington, party, Santa, singing. Bookmark the permalink.